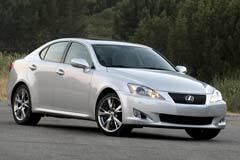 The Lexus IS is a great buy for those who would like to invest in a car that is luxurious but compact at the same time. In fact, there are many who opt for a used Lexus IS rather than buying a Mercedes or BMW. This sports vehicle has several features worth taking into account. For starters, its carbon emissions are really low. The price range is also quite affordable when compared to similar models on the market. The performance of the Lexus IS is really good even though it is a gas-powered engine. One can rest assured that it operates smoothly, making it a pleasure to drive anywhere. This is enhanced by its Adaptive Variable Suspension system. The cabin is well organized and very luxurious. It features leather upholstery, Digital Audio Broadcasting radio, a 7inch display, Bluetooth connectivity, and dual-zone climate control are some of the features one can benefit from when buying a Lexus IS. 2016 IS F-SPORT / NAVIGATION 2016 Lexus IS 200t, Ultra White with 29831 Miles available now!